In 1979 Prof. Gabriel Barkay decided to do some archaeological research outside the walls of the Old City and decided on a ridge above the Hinnom valley by the Scottish Church of St. Andrew in Jerusalem. 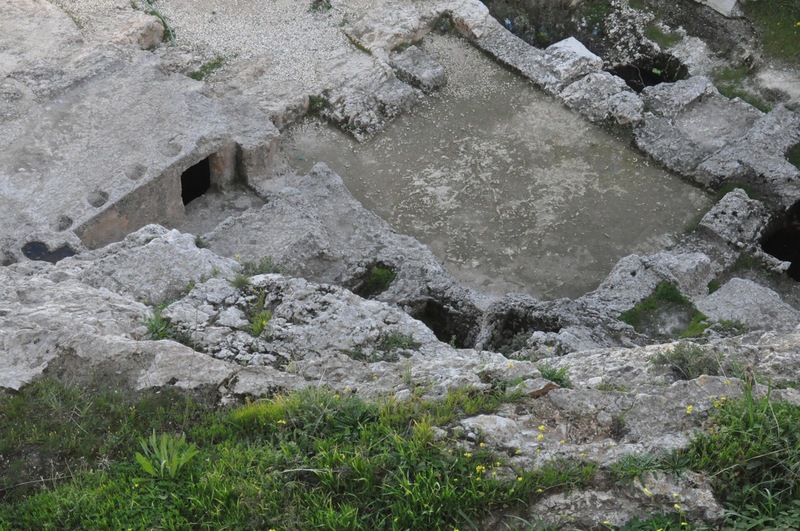 He called the area Ketef Hinnom and did a survey that uncovered the remains of a Byzantine church with mosaic floor and some tombs hewn in the rock whose roofs had collapsed. With the help of 12-13 year olds from a youth group from Tel Aviv run by the Society for the Protection of Nature he began excavating. They found one bead – it was clear that the tombs had been looted in antiquity. A boy by the name of Nathan was assigned to clean a nook underneath one of the burial benches. By chance he also had a hammer and after cleaning, he got bored and started banging on the floor of the nook. To his surprise the stone bottom broke revealing an entryway to another room full of treasure. All the dirt removed from the tombs was stored in large plastic boxes donated by Tnuva [Israel’s largest dairy and today a billion dollar food conglomerate] and sifted under lab conditions. In the sifting, a second, smaller silver object, 4 cm in length, was also found. Both objects have the Priestly Blessings from Numbers 6:24-26 engraved on the silver in proto-Hebrew script. The Lord lift up His countenance upon you and grant you peace. Because of the pottery and the script, the objects are dated to the 7th century BCE (while the First Temple was still standing), to the time of the prophet Jeremiah. These are the oldest examples that we have found of a Biblical text on an archaeological artifact, about 400 years older than the Dead Sea Scrolls. The discovery of the silver amulets received very wide public interest. In the 1990s Dr. Bruce Zuckerman from the University of Southern California, an expert who specializes in photographing ancient texts (various Dead Sea Scrolls and the Leningrad Codex) arranged to photograph the amulets using the latest photographic and computer imaging techniques. This made it possible to zoom in on every letter and even superimpose complete letters on broken letters, reconstructing broken letters in the scribe’s own peculiar style to better decipher those that were unclear. The result was that they were able to identify another biblical verse on the larger scroll, from Deuteronomy 7:9. Know, therefore, that only the Lord your God is God, the steadfast God, who keeps His covenant faithfully to the thousandth generation of those who love Him and keep His commandments. Read the Life and Land blog for a first-hand report from Gordon Franz who as a 25-year old was at Ketef Hinnom working with Prof. Gaby Barkai. The two amulets are on display in the Archaeology wing of the Israel Museum. I can take you to Ketef Hinnom to see the First Temple period tombs where the amulets were found. This entry was posted in Archaeology, Jerusalem, Tomb and tagged amulet, Biblical verse, family tomb, jewelry, Ketef Hinnom, postaweek2011, Priestly blessing, silver, Tomb on March 16, 2011 by Shmuel Browns.